I use a super-soft bristle toothbrush. I’ve read too much about rubbing off your enamel to use a regular toothbrush. There are lots of toothbrushes that say “soft”, but I disagree with that appellation most times. I think most toothbrushes feel like wire. The softest brush I’ve found is from the Korean grocery store that’s near my school. I’ve even posted about it. I keep forgetting to stop by H-Mart to get a new brush, but I was at a different grocery store the other day and decided to take a look at their toothbrush offerings. 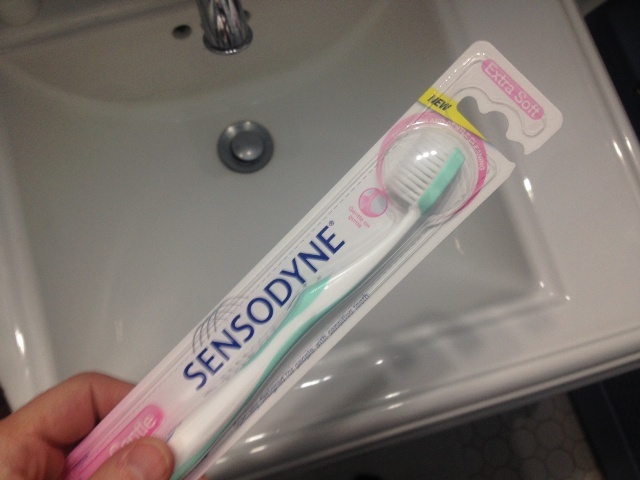 I saw something interesting: a Sensodyne ‘Extra Soft’ toothbrush. I decided to get it. It is wonderful! It really is extra soft – just what I want! This entry was posted in Toothpaste. Bookmark the permalink. Is it like brushing your teeth with a cloud? I’m pretty sure I’ve scrubbed off some enamel on my teeth. Also, thank you for stretching my vocabulary with the big words. Off to look up ‘appellation’…..
Have you ever tried a toothbrush with silicone bristles? I have, and it’s weird for me….but I think you would like it. I haven’t. And now I’m very curious. I didn’t know these existed. Now I’ll have to be looking for them when I’m in the toiletries aisle.